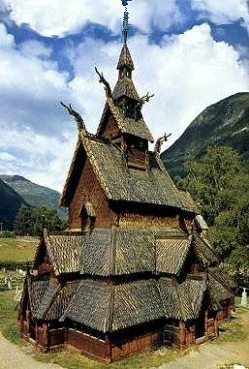 Norwegian stave churches were built just after the close of the Viking Age in Scandinavia in the 1100 and 1200’s. The technique of using vertical posts-or staves- had been modified over time to become wooden architectural works of art. None of the 29 stave churches that now survive belongs to the first generation (11th century) of Norwegian churches. Even though they were constructed of wood, a very few stave church ( 12th century ) is still surviving in Norway today. The authentic Borgund Stave Church of Lærdal in Sogn located 30 kilometers from village Lærdalsøyri is the best preserved medieval Stave Church still around.